Ford points to their all-new Focus, saying it delivers more style, space and advanced driving technologies for mid-size family car customers than ever before. It arrives into Ireland this month and priced from €24,900. The car will initially be available in 4 series in Ireland: ‘Zetec’, ‘ST-Line’, ‘Titanium’ and ‘Vignale’. Specification details on the entry level ‘Zebec’ level includes: 16” alloys; LED DTRLs; 6.5” SYNC 3 with Android Auto & Apple CarPlay; selectable drive modes; cruise control; pre-collision assist including vehicles, pedestrians and cyclists. Ford says that their engineers collaborated closely with car-buyers to develop the all-new Focus five-door hatchback and even more practical Focus wagon models in distinctive versions. It adds that each has their own personality, including the stylish Focus Titanium, sporty Focus ST-Line and upscale Focus Vignale. The all-new Focus Active crossover model, which will arrive in Ireland in early 2019, features rugged sports utility vehicle-inspired styling that includes raised ride-height, roof bars and additional cladding. The blue oval car brand says that all-new Focus also introduces a comprehensive range of advanced driving technologies that can help drivers make light work of stop-start traffic; see more clearly when driving in the dark; park simply by holding down a button; and avoid accidents. The sporty all-new Focus silhouette is the most aerodynamic in its class, according to Ford. It points to the athletic and dynamic design, with a long bonnet and muscular rear haunches, and that each model is differentiated with unique elements including satin aluminium details for the Vignale exterior; a large spoiler and open front apertures for the ST-Line; and on the way, the contrast silver front and rear skid plates for the Active. Inside, simple, clean lines, expressive materials and seamlessly integrated surfaces combine to make travelling in the Focus a more calming experience. And Ford says that the front doors now flow fluidly behind the instrument panel for a wrap-around effect, and soft touch materials deliver a more premium feel. It also boasts that the high-end consumer product design is reflected with polished glass and brushed finishes. Unique features and materials include fine-grain wood-effect finishes and premium leather for Vignale, sporty carbon fibre-effect finishes and red stitching for the ST-Line, and more rugged, textured materials and surfaces for the Active. Ford also claims that the all-new Focus also provides more space inside for passengers and luggage. More than 5 centimetres additional length between the front and rear wheels allows class-leading knee clearance for rear seat passengers, and all occupants benefit from the wider interior – there’s 6 centimetres more shoulder room in the rear. The impression of spaciousness is enhanced with a rear door design featuring windows that stretch further back for a more open sensation, and an openable panoramic roof that lets light flood into the interior. It quotes the example of being able to accommodate a large dog crate without needing to fold the rear seats, the all-new Focus wagon boot space is easy to access, using a simple kicking motion under the rear bumper to open the Hands-free tailgate. Folding the rear seats is also simplified – they now drop simply by pulling a switch in the boot space. The all-new Focus introduces FordPass Connect onboard modem technology for customers in Europe, turning the vehicle into a mobile WiFi hotspot with connectivity for up to 10 devices. FordPass Connect also enables Live Traffic updates for the navigation system, and using the FordPass mobile app drivers can easily locate their car in sprawling shopping mall car parks, check fuel levels, remotely lock and unlock their car, and even start it remotely. Compatible with Apple CarPlay and Android Aut, SYNC 3 allows drivers to control audio, navigation and climate functions plus connected smartphones using pinch and swipe gestures on the 8-inch touchscreen, and simple voice commands. A new 675-watt B&O PLAY sound system helps occupants get the best from music streamed via FordPass Connect or smartphone. 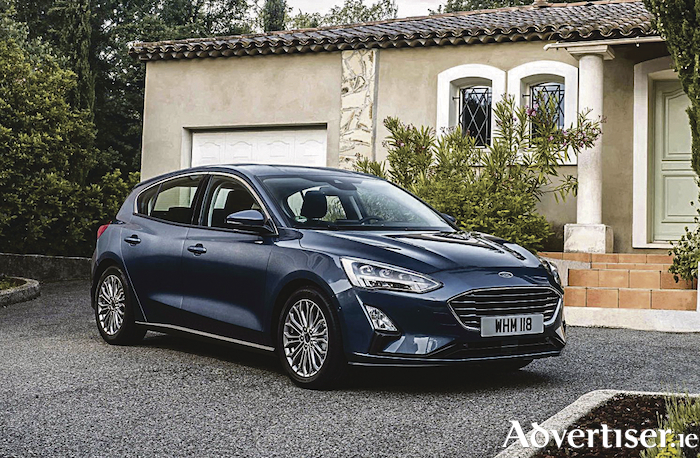 Advanced driver assistance technologies make driving a Ford Focus on motorways, in stop-start traffic and in town easier than ever before; and they are designed to make the driving experience more comfortable, less demanding and safer. Buyers can also choose from manual six-speed transmissions that are smooth and refined to operate, and a new eight-speed automatic gearbox that adapts to different driving styles to offer what Ford says is the smoothest gear changes at the best possible time. Finally, the all-new Ford Focus has been awarded the maximum 5-star safety rating by independent crash test authority Euro NCAP. It is one of the first vehicles to be awarded the highest rating under new, more stringent Euro NCAP testing protocols.